Plastic boxes & plastic containers of all sizes and all types are always required. 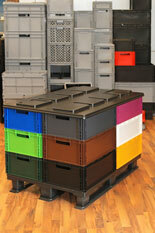 From large collapsible & rigid Pallet boxes, to small folding Plastic Baskets & trays. Our opening hours are 7.30am to 4pm Monday to Friday. Collections can be arranged on large quantities. Please complete our online form or call one of our sales team 0800 0288 655 for more details.